I'm your creative coach! Here to share simple, easy to make projects and teach you how to use Stampin' Up! products. Hello Stampers! 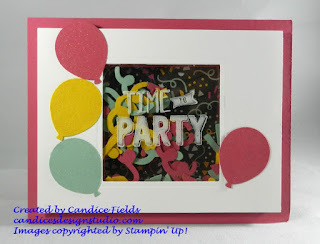 Today's project was inspired by a card I saw on the Stamping and Blogging website. For my card, I used the Confetti Celebrations stamp set, along with the Sprinkles and Balloon punches. I did use the retired It's My Party DSP since I was making it for a friend. To make the window, I used the Layering Squares framelits. It would've been nice to create frame for the window, but it was too late when I thought about it. I added some clear Wink of Stella to my balloons for some added shine. I used the Sprinkles punch to create the confetti for the shaker card.